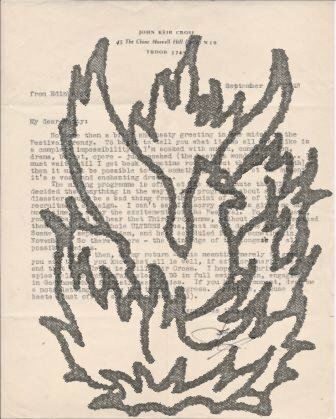 Corrected typescript of Scottish science-fiction writer John Keir Cross's unpublished BBC radio verse play 'The Balloon', with five Typed Letters Signed and one Autograph Letter Signed from Cross to the Faber production manager Montague Shaw. Script of 'The Balloon', c. 1946. Letters dating from between 1948 and 1966; the first three from Muswell Hill, London; the last three from South Brent, Devon. Typescript of 'The Balloon': landscape 8vo, 24 pp. Text clear and complete. On aged paper. With pencil emendations (including the deletion of a number of passages) on practically every page. Described by Cross as a 'radio composition' and a 'fantasy for broadcasting', 'The Balloon' presents an absurd take on T. S. Eliot's verse plays. It was transmitted on the Scottish Home Service of the BBC in 1946, with music by Cedric Thorpe Davie (1913-1983). There is no record of it having been published. The five typed letters total seven 4to pages. The autograph letter is landscape 12mo, 1 p.